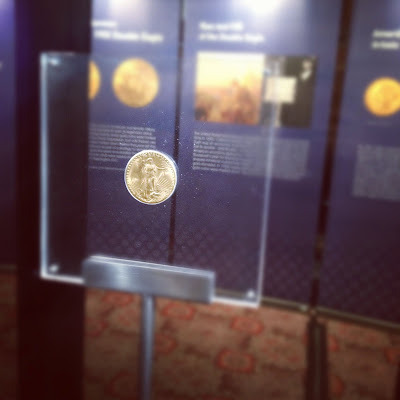 On Sunday I had the pleasure of attending The London Mint Office's exhibition of one of the world's rarest coins: a 1933 gold "Double Eagle". The Goldsmiths Hall is a "venue" with lots of old gold- and silverware on display. You can rent it out, apparently, and the organisers had rented the Livery Hall, which is an incredible sight and well worth a look if you ever have an excuse to see it. Not only is it sumptuously decorated and lit with wonderful chandeliers, but the stained glass windows are a wonderful record of the wardens of the Goldsmiths' Guild. The exhibition itself was surprisingly small, occupying the tiniest corner of the Livery Hall. It consisted of merely 23 golden coins of various ages and denominations, and the aforementioned Double Eagle. I have to say, I was quite disappointed with the showpiece of the exhibition - it simply doesn't look like five million quid on the hoof. However, the attendant was very knowledgable and was able to impart a vast amount of numismatic knowledge to me in a very short time. Out of the other parts of the exhibition, the real "stand-out" coin (ha! ha!) was the "high-relief" 1907 Double Eagle, which apparently had to be "struck" five times to get the high relief. This made the coin very difficult, expensive and time-consuming to produce. It really does make for a beautiful coin though. Another remarkable moment and discovery in London! Hmm, interesting. I didn't even know that Goldsmith's Hall was open for visitors, let alone dinner party hire etc. I might look in next time I'm in London. Worth reading is "Double Eagle: the epic story of the world's most valuable coin" by David Tripp, can be picked up cheap secondhand. You'll then wonder who insisted on the visitor list. We would be honored if we could republish the rss feed of "Obnoxio The Clown" in our European Union category. Our readers need to read what experts like you have to say.